American Express and the U.S. Travel Association sponsors a travel promotion called Daily Getaways in efforts to get people out traveling in the US. All the deals are discounted stay packages or miles and points, and sometimes you can get them for a huge discount. The promotion runs from June 10 – July 12, 2013 and each week will feature five daily travel deals that go on sale at 1:00 pm EDT each day. You can get an additional 10% off of the purchase if you use an American Express card to buy any of the deals. The first week features deals from Marriott, Harrah’s, Alamo, City Pass and Busch Gardens. 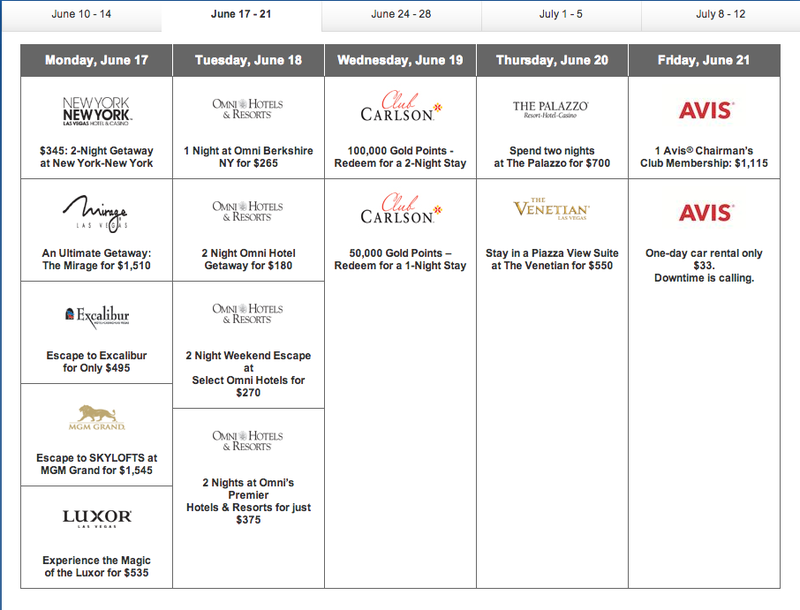 During the second week of June 17-21 there are some Las Vegas packages and possibly the most valuable deal–50,000 Club Carlson points for $194. The deal offering Club Carlson points for 0.388 cents each (normally they cost 0.7 cents) is by far the most attractive deal. By buying 50,000 Club Carlson points using an American Express card it will cost $174.60, bringing the cost per point to 0.349–essentially half of what they usually cost. 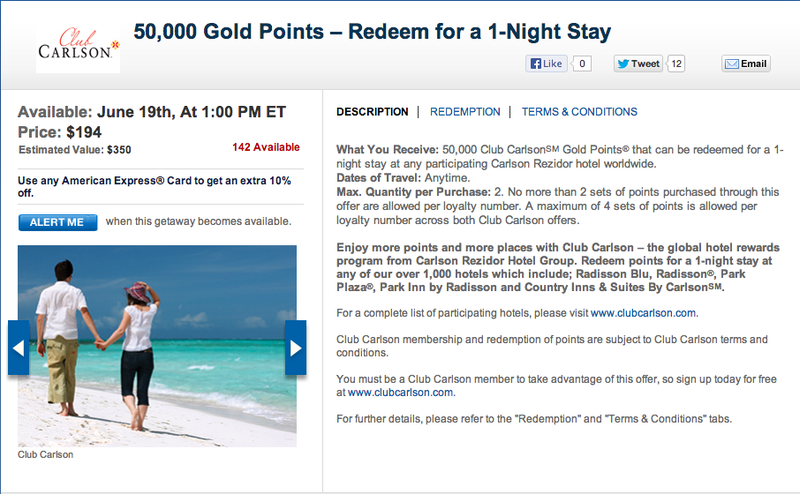 There is also an option to buy 100,000 Club Carlson points for $385. The best use of these points is to maximize them by using the bonus award nights that the Club Carlson co-branded credit cards give you at a top-tier Radisson Blu Property. Club Carlson credit card holders get the exclusive benefit of a free last night of any award reservation of 2 or more nights. Many top-tier Radisson Blu properties in Europe, like the May Fair in London or the Radisson Blu Ambassador Hotel in Paris, have room rates this summer starting at about $450 per night. Some nights are going for $600.00 at the Radisson Blu Hotel Champs Elysees, Paris so the potential to redeem for more value is possible. Let’s say you buy 50,000 points using an American Express card for $174.60 and have one of the Club Carlson credit cards letting you book 2 nights for the price of one. Assuming award availability for the nights you want, you are getting $900.00 or more in value for the 50,000 points that cost you $174.60–a very good deal. Also if you have the Club Carlson Visa you will receive ant automatic room upgrade upon availability at check-in, but I wouldn’t hold my breath for those during peak travel season in Europe. You must be a member of Club Carlson to participate. If you are not a member, click here to join today. 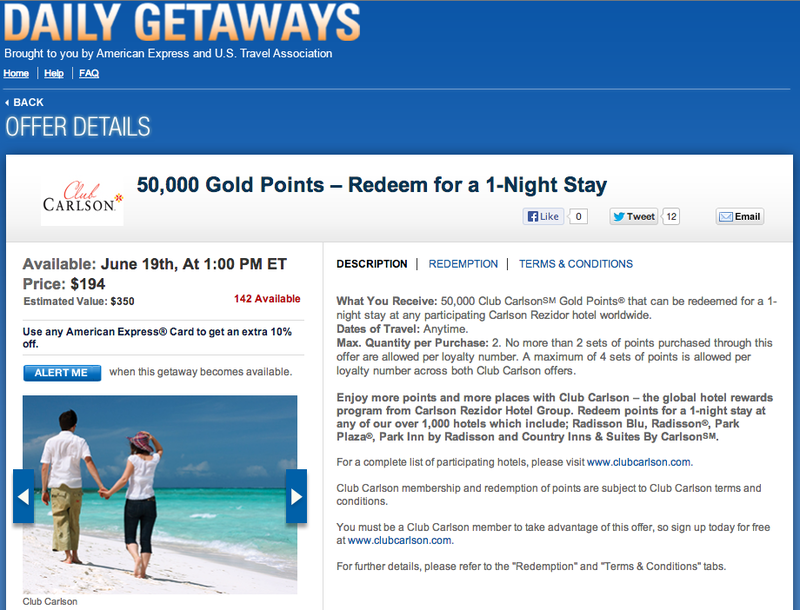 Gold Points will be posted to the Club Carlson member account upon validation of purchase from the Daily Getaways promotion. Allow 2-3 weeks for Gold Points to be credited to a member’s account. No more than 2 sets of points purchased through this offer are allowed per loyalty number. 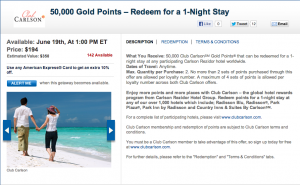 A maximum of 4 sets of points is allowed per loyalty number across both Club Carlson offers. Any resident of the U.S. who is 18 years or older may purchase an offer with any valid credit card. Offers go on sale at 1:00 pm ET each weekday between June 10, 2013 and July 12, 2013. Quantities for these items are extremely limited—usually just a few hundred each—and may sell out quickly. However, in the event that they do not sell out the day they go on sale, they will appear on the “All Available Offers” page. You may purchase offers featured on this page 24 hours a day, 7 days a week until the promotion ends on May 25, 2012, or until the offers sell out. When will I see my 10% discount for using my American Express Card? The published retail value of the offer is pre-savings. In the e-commerce process, once you have entered your credit card information you will see the 10% price deduction at checkout if you use an American Express Card. The retail price minus 10% is what will be charged to your American Express Card. Nice deal! This will be great for my trip next month if I can get 50,000 points and will save some money. Thanks!